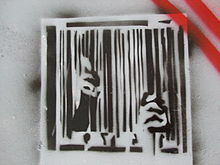 An anti-consumerist stencil graffiti saying "Consuming consumes you"
Anti-consumerists believe advertising plays a huge role in human life by informing values and assumptions of the cultural system, deeming what is acceptable and determining social standards. They declare that ads create a hyper-real world where commodities appear as the key to securing happiness. Anti-consumerists cite studies that find that individuals believe their quality of life improves in relation to social values that lie outside the capability of the market place. Therefore, advertising attempts to equate the social with the material by utilizing images and slogans to link commodities with the real sources of human happiness, such as meaningful relationships. Ads are then a detriment to society because they tell consumers that accumulating more and more possessions will bring them closer to self-actualization, or the concept of a complete and secure being. "The underlying message is that owning these products will enhance our image and ensure our popularity with others." And while advertising promises that a product will make the consumer happy, advertising simultaneously depends upon the consumer never being truly happy, as then the consumer would no longer feel the need to consume needless products. Anti-consumerists claim that in a consumerist society, advertisement images disempower and objectify the consumer. By stressing individual power, choice and desire, advertising falsely implies the control lies with the consumer. Because anti-consumerists believe commodities supply only short-term gratification, they detract from a sustainably happy society. Further, advertisers have resorted to new techniques of capturing attention, such as the increased speed of ads and product placements. In this way, commercials infiltrate the consumerist society and become an inextricable part of culture. Anti-consumerists condemn advertising because it constructs a simulated world that offers fantastical escapism to consumers, rather than reflecting actual reality. They further argue that ads depict the interests and lifestyles of the elite as natural; cultivating a deep sense of inadequacy among viewers. They denounce use of beautiful models because they glamorize the commodity beyond reach of the average individual. Some[who?] adherents to the Austrian economic philosophy advocate against consumerism due to its effect of contributing to "debt slavery." Austrian economic advocates focus on the entrepreneur, promoting a productive lifestyle rather than a materialistic one wherein the individual is defined by things and not himself. Many[who?] have accused anti-consumerists of opposing modernity or utilitarianism. Right-wing critics see anti-consumerism as rooted in socialism. In 1999, the right-libertarian magazine Reason attacked anti-consumerism, claiming Marxist academics are repackaging themselves as anti-consumerists. James B. Twitchell, a professor at the University of Florida and popular writer, referred to anti-consumerist arguments as "Marxism Lite." In the novel American Psycho by Bret Easton Ellis, the protagonist Patrick Bateman criticizes the consumerist society of America in the 1980s of which he is a personification. Later on he goes on a killing spree without any consequences, suggesting that the people around him are so self-absorbed and focused on consuming that they either don't see or don't care about his acts. ^ "Postconsumers". Postconsumers. 2018-06-13. Retrieved 2018-10-18. ^ a b Kakutani, Michiko (2013-02-17). "'Banksy: The Man Behind the Wall,' by Will Ellsworth-Jones". The New York Times. ISSN 0362-4331. Retrieved 2018-03-16. ^ Majfud, Jorge (August 2009). "The Pandemic of Consumerism". UN Chronicle. 46 (3–4): 85. Archived from the original on 19 July 2013. ^ Renfrew, Colin; Bahn, Peter (2008). Archaeology: Theories, methods and practice (5th ed.). London: Thames & Hudson. ISBN 978-0-500-28719-4. OCLC 181139910. ^ "communityplaythings.com - Our History". www.communityplaythings.com. Retrieved 2017-06-16. ^ kanopiadmin (27 October 2000). "Consumerism: A Defense - Tibor R. Machan". ^ Twitchell, James B. (August 2000). "In Praise of Consumerism". Reason. ^ Varul, Matthias Zick (May 2013). "Towards a consumerist critique of capitalism: A socialist defence of consumer culture". Ephemera: Theory & Politics in Organization. 13 (2): 293–315. ISBN 9781906948177. ISSN 1473-2866.